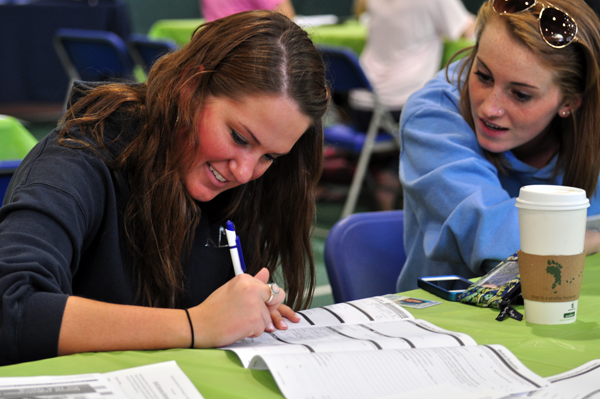 Sisters of Kappa Alpha Theta host a bone marrow drive. A Quinnipiac student swabbing her cheek, Thursday at Burt Kahn for Kappa Alpha Theta bone marrow drive. A Quinnipiac listing to the direction of the proper way of swabbing her cheek on Thursday at Burt Kahn for Kappa Alpha Theta bone marrow drive. Sisters of Kappa Alpha Theta, Thursday at Burt Kahn for their bone marrow registry event. Quinnipiac student filling out a applications to get their cheek swabed, Thursday at Burt Kahn for Kappa Alpha Theta bone marrow drive. A worker of the bone marrow registry placing the final touches on a application, Thursday at Burt Kahn for Kappa Alpha Theta bone marrow drive. A Quinnipiac student placing a cotton swap with her cheek cells to be sent to a registry,Thursday at Burt Kahn for Kappa Alpha Theta bone marrow drive.